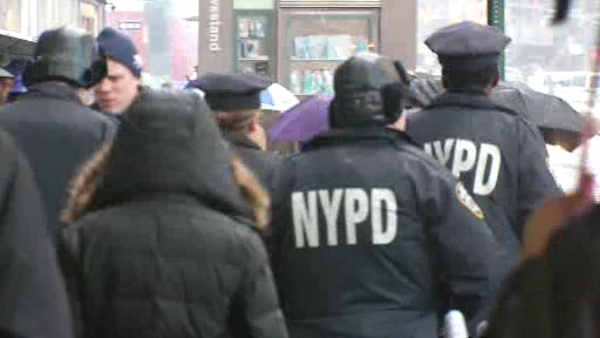 NEW YORK (WABC) -- Amid concerns about excessive force, the New York Police Department launched a new program Thursday to document and review every physical encounter officers have with the public. The program will allow the nation's largest police department to track and analyze all instances when force is used, police officials said. The officials also announced new guidelines emphasizing "the duty of all members to protect human life, including people in their custody." The reforms were announced the same day the city's inspector general, Philip Eure, released a report faulting the NYPD for not doing more to discourage the excessive use of force. For example, force was used in the takedown of James Blake, but was not documented. And the officers involved then failed to notify their superiors of the takedown. Under the new guidelines, the officers would have to document that incident as force used, checking a box on the report indicating the type of force, even though it did not result in an arrest. The information will be used to create a database, which the NYPD will eventually be able to show the community in the form of statistical breakdown of officers' actions. The NYPD will also publish an annual report analyzing the documented episodes. They hope that will lead to better understanding of police encounters. In a message to the NYPD, Bratton said "The vast majority of the time, cops use force because force is used against them. Using force against a cop is never permissible, and this fact is worth repeating: under the New York State Penal Law, there is absolutely no right to resist arrest." "No amount of new training or additional paperwork will make necessary force that is lawful and properly used by police officers acceptable to those who want to return to the hands-off, reactive policing strategies that sent crime soaring in the past. More paperwork coupled with a serious shortage of police officers and the continual second-guessing of their actions is a formula for disaster. It is a call for police officers to disengage themselves from the very proactive policing that brought this city from the brink of disaster in the 1990s. We've lived through the era of reactive policing where cops could do nothing but respond to 911 calls, causing crime and disorderly behavior to run rampant in our neighborhoods. New York City police officers want to keep our streets safe. To do that, we need support - not more reports." In its report, the Inspector General faulted the department for not better tracking "use of police force." "Our reaction, as in this report, is that it is absolutely unacceptable that there is not a central mechanism for tracking and reporting use of force," said Department of Investigation Commissioner Mark Peters. Curbing the use of force is a huge issue in police departments across the country. The Inspector General praised how Los Angeles and Seattle record things, and found fault with New York. "They have modern state-of-the art use of force policies," said Eure. "NYPD was living a little bit in the dark ages with respect to its use of force policies." "I would take strong, strong exception to that language," said Bratton. "That is an outrageous comment. This department is nothing close to being in the dark ages." Police brass were livid with what the Inspector General said. Still, the department is changing how it records "use of force". -All such cases must be reported, even minor ones. -De-escalation will be emphasized in police training. -And a new beefed-up unit will investigate complaints about excessive force. But the "dark ages" comment about current police police still infuriated Bratton. "I am very proud of this organization and if the Inspector General of this city feels that we are in the dark ages, well, I think he's going to have to start analyzing his capabilities to analyze. We are an exceptional police organization."